A Journey With Buddha’s Daughters. September 16, 2018 in Books, Reviews. Buddhism developed varying traditions as it took root in different cultures around the world. In some of those cultures, the role of women in Buddhism – as nuns and as lay practitioners – has been minimised or even subsumed entirely under that of monks. Even though the Buddha himself, when asked by his student Ananda, said “Yes of course women could become enlightened”, these ongoing cultural traditions can make it very difficult for women to progress along the path and, crucially for practitioners looking for real inspiration, this also makes it very difficult to find out anything about them. Any book focusing on Buddhist nuns would necessarily have to at least touch on this issue, and The Saffron Road: A Journey with Buddha’s Daughters does it very well. But this is not a political text. It is really more of an adventure. Toomey travels the world and talks to dozens of Buddhist nuns – women of all ages, from all walks of life, and from countries with long-standing Buddhist traditions as well as countries where Buddhism has been more recently established, e.g. England, France, and America. Her main aim is to get an idea of what motivated each of them to become a nun and what keeps them going, and their reasons are as varied as their dress. She interviews nuns from the Vajrayana, Theravada, and Zen traditions, giving the reader a real feel for each one, and an understanding of the cultures where they thrive. You get some idea of the scale of this project when Toomey explains here and there about making appointments months in advance, being asked to attend week-long courses so that she might better understand a tradition, and taking part in the daily schedule of prayers and meditation. She finds herself slightly lost in an untended wood looking for an unmarked, isolated retreat, wandering through the oldest part of San Francisco, driving through the rolling hills of the Dumfries countryside, and practising zazenin Japan – where, by the way, the first ordained Buddhist was a young woman. 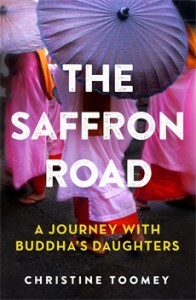 The Saffron Road is very much like a travel narrative: once you’re finished, you not only feel you know more about Buddhist nuns, and Buddhism, but more about the world. Toomey, as an experienced international journalist, has the perfect touch when it comes to knowing how long to spend with each person, and – critically – what kinds of questions to ask. Some nuns have had difficult experiences in their lives, and Toomey is very careful not to pry. But she brings out their excitement and devotion, and as stories of Buddhist women are still relatively thin on the ground, this makes The Saffron Road an invaluable contribution to the Buddhist experience. You don’t have to be a woman to enjoy this book – you could argue, in fact, that missing half of humanity’s experience with Buddhism doesn’t do anyone any favours, male or female. Like the wings of a bird, Wisdom and Compassion need each other to really fly. Dr Gwen Enstam is Project Developer for The Association for Scottish Literary Studies. She is the editor of the online magazine The Bottle Imp. Originally from Dallas, Texas, Gwen has made her home in Edinburgh. An interesting interview of Dr Gwen Enstam can be found on Books From Scotland.